Mmm ... Mini Jaffa Cakes. On our first day B & I crashed fairly early. The next day Taffy picked us up and took us shopping to stock up our larder; that night they fed us at their flat. Over the next few days I began to explore Oxford, walking along the river and into the city centre. It is truly an amazing city with some extraordinarily beautiful buildings; most of the centre is mostly car free and a pedestrian's (and cyclist's) paradise. One of my highlights so far has been a visit to the History of Science Museum which is currently housing an exhibition of Steampunk. 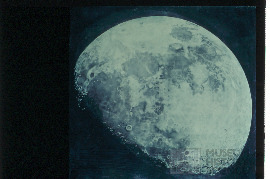 The museum's collection is also fascinating and includes the original of the pastel of the moon by John Russell which appears in the book The Lunar Men which I have been reading. Barbara has been busy as well. As she can't walk very far she has obtained herself a little electric-powered scooter which allows her to get around without having to rely on Taffy. As she will be here for around three months it makes good sense. J&T's baby is due any minute and J is impatient for it to be over. I got to Barbara's late afternoon and we were picked up by the limo around 7pm to whisk us off to Tullamarine. Once there a wheelchair was produced and Barbara was wheeled off, with me following, to the Qantas Business Lounge, with express passage through check-in, security, etc. We weren't long in the lounge before we were called for the flight and again a wheelchair and pusher materialised for Barbara. Once on the plane we were each presented with a glass of french champagne (Mumms) and settled down, getting ourselves acquainted with the amazing seat, which, along with being able to transform into a totally flat bed, had a massage setting. The food was delicious - my breakfast actually included poached eggs - and we were waited on hand and foot. We had a two-hour stopover in the Business Lounge at Abu Dhabi before heading off on the second leg to London. We were both able to get some sleep on the plane, helped by being able to lie flat. On arrival at Heathrow we were fast-tracked through Immigration and Customs (B in wheelchair) before being deposited at the limo which took us straight to Oxford. When we arrived at Oxford Taffy and Julie were there to help settle us in. It's a nice little flat: one bedroom, bathroom and living area with kitchen space. I sleep on a foldaway bed provided by T&J. There's a washing machine (thank goodness) and a teeny-tiny TV providing access to a mind-numbing array of channels, most of which we have absolutely no interest in. It's a ten-minute walk out of the centre of Oxford. Last week was brightened by a visit to DG in Castlemaine; the weather was glorious and on Wednesday we did a lovely drive to Clunes and surrounding towns. In the evening we had a meal at the Railway Hotel which, as usual, was extremely busy. Good hearty and cheap food. On Monday and again on Thursday we had rehearsals for Friday's concert to open the Spring Early Music Festival. Friday was a busy day as in the morning ST and I went to Torquay to sing for the funeral of DD's mother - then it was back to Melbourne and the concert in the evening.. The main work was the Brumel Earthquake Mass, an extraordinary 12-part work with wide-ranging parts and exciting rhythmic ingenuity to test one's wits. This went off fairly well, though not without a few odd glitches and, as BO calls them, sharpranos raising the pitch. The highlight of the evening for me, and others, was Gombert's setting of Lugebat David Absalon, an extraordinarily moving work which on Friday night seemed to have an emotional life of its own - an amazing experience. Yesterday saw the usual shopping and brunch in Brunswick Street with P&B, always fun, followed by a lazy afternoon and a televisual evening. Today I've been quite industrious, sorting through a lot of papers and throwing away lots of rubbish. I figure if I take B's advice and do an hour a day I'll be completely organised by ... oh, perhaps 2012.